With most of the current laptops not having an RS232 serial port it can be very inconvenient having to find a USB to RS232 converter that works reliably across a large range of products. 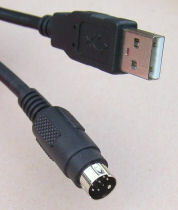 This cable does not need a converter as it is a USB cable, one end plugs into a USB port and the other end plugs into your PLC. Supplied complete with a driver CD, however on installation the PC found the latest drivers from Windows Update.